The RHS Chelsea Flower Show is the world’s most prestigious flower show and runs from 22 May – 26 May 2018. To help celebrate we'd like to showcase some of our favourite cheeses that use flowers in interesting ways and some delicious floral wines; all available in store. ‘Cigarillos’ of small, fresh log-shaped cheeses on a flat wooden base. Topped with a sprig of fresh Sariette (Summer Savoury), the cheese can be eaten rindless and fresh or slightly matured. Young cheeses are bosky and lemony, however once the rind begins to develop the taste becomes tangy, and fruitier, with an almost medicinal edge. Best season is April through September. The spirit and taste of Provence comes through with this richly textured brique. 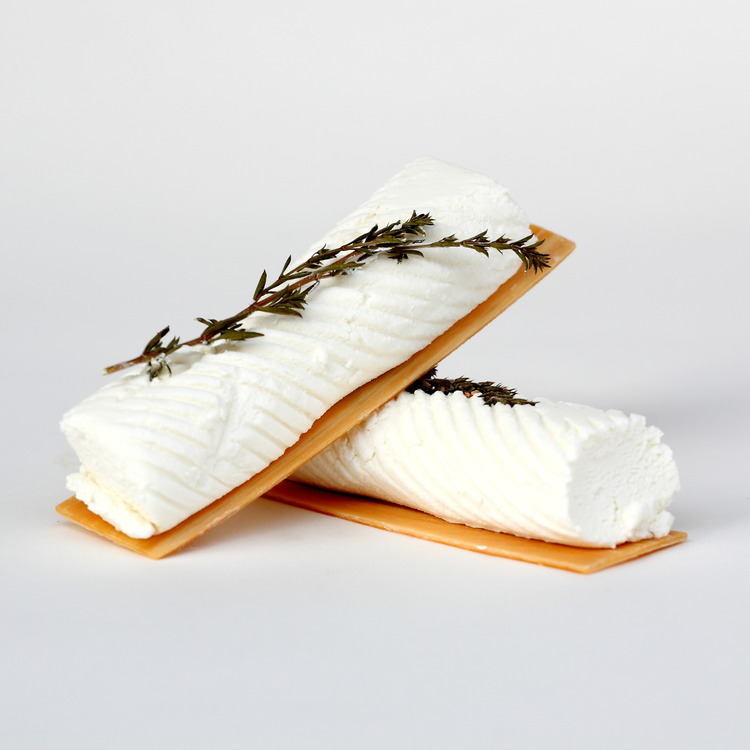 Topped with a sprig of lavender, this cheese typifies the taste and terroir of the south of France. Curdy and lactic with fresh nutty and herbaceous notes, Southern Rhone and Provençal reds pair well with their hints of violet and cherry. However the best marriage of flavour will most likely come with a chilled rosé or a dry white from the region. This is a lovely addition to summer plates as this cheese is seasonal. A fresh cheese with a solid consistency, completely covered with aromatic herbs such as rosemary, thyme, fresh sweet chillies. Classic, handmade, with a melt-in-the-mouth texture and a sweet nutty taste which becomes even more aromatic when allowed to mature – spurring velvety blooms over the herbs – and the edges begin to melt. A large cutting cheese with a smooth, buttery texture and a rich, slightly earthy, tangy taste. The cheese is covered in herbs and spices – Thyme, Juniper Berry, Chili, Rosemary – in the style of the Corsican Fleur de Maquis, which imparts a delightful bosky aroma and flavour. Isny Dairy is a collective of 7 organic dairy farmers. The high quality of the alpine milk is reflected in the quality of the cheese and Evelyn Wilde the Cheesemaker produces a hard washed crust cheese Adelegger as well as fresh Quark which showcases the natural Sweetness of the milk. This blossom cheese is semi hard with a light milky fresh cobnut taste with the added bosky aroma and flavour of dried alpine flowers and herbs pressed onto the cheese. Coagulated with flowers from the Cardoon Thistle — which grows in the hills surrounding the dairies — this gives a distinct herbaceous flavour to the rich flowing curds, finishing with a wild, sharply sweet earthiness. Made by hand, the wheels are bathed in brine, then rubbed to give a smooth, almost waxy feel to the finished rind. Full-bodied dry red wines are an ideal match. Made using the same curds as Charles Martell's famous Stinking Bishop – however instead of washing it in perry and placing it in a box, we simply brine washes and covers in chopped nettles. The texture is rich and buttery and the flavours are savoury and tart with a herbal boskiness coming through from the nettles. A small independent vineyard worked by a father and son team over 3 generations (c.1959). Their simple motto is to respect the land & environment and produce traditional authentic styles. The Cremant is methode traditionnelle (Champagne method) - lively with a forward racy fruit and a delicate red grape aroma. Its easy drinkability makes it a perfect aperitif. Roberto Sarotto’s delicious earthy light textured classic wine with a light “fizz” on the nose. Lovely as an aperitif as well as accompanying delicately cooked foods. If you like Gavi di Gavi style wines, then you will love this wine too as it has the same sort of fruity ripeness but with more earthy interest. Andrew and Emma Nielson produce wines with very low to no sulphur bottling, and this Beaujolais is from Cru Grapes (Cote de Brouilly and some Fleurie Poncie) that has produced a lovely, fresh and fruity wine with plenty of character from the low intervention techniques. It is easy to enjoy and works well with cheese and charcuterie as well as meat or even fish dishes.